This proud, beautiful and deep part of the world has been plundered, ravished and humiliated for many centuries, first by the Europeans (both the Spaniards and French), then by the Norteamericanos. The vulgarity and brutality of the conquest had often been unbelievably grotesque, unreal, insane–to the point that I decided to name it a “magical imperialism” (or call it ‘magical colonialism’ if you wish). Great cultures created by Mayas, Aztecs and other native people–cultures much more advanced than those of the Europeans, have been crushed, tricked, cheated, and finally forced into submission. Local gods were ‘sent to a permanent exile’ and Catholicism, under the threat of death or torture or both, was forced down the throat of everyone. Yes, Western colonialism often takes truly bizarre, surreal, forms. What example should I provide, to illustrate ‘magic imperialism’? For example, this one: in Cholula, near the city of Puebla, Spaniards slammed their church on top of the biggest (by volume) pyramid on Earth–Tlachihualtepetl. It is still sitting there, even now as I write this essay: the church is sitting on top of the pyramid, unapologetically.Local authorities are even proud of its presence, promoting it as a ‘major tourist site’. I hope, one day, UNESCO includes it in the “memory of humanity” list, as a symbol of cultural vandalism. We are strongly discouraged from speaking about brutality of the past. Mexico’s attitude towards its own history is truly schizophrenic. On one hand we know that our country was plundered, raped and abused, by the Spanish colonizers, by the French, and then by the U.S. But we, scholars, teachers, curators, are literally ordered to ignore it, to ‘be positive’; to ‘look for good things’ in what was done to us, and what we inherited. In the past, the church had been hit and damaged by lightning, on several occasions, and the local people believe that it happened because of the wrath of local gods, who were protesting against the desecration of their site and an architectural masterpiece–the pyramid. However, the structure was always quickly restored by the religious and state authorities. The church still dominates the landscape, visible from as far as the city of Puebla, while the grand pyramid looks humiliated and belittled, like nothing more than a forested hill. Mexico suffered for centuries, and it is suffering now. It is one of the greatest countries on Earth. In fact, it is not just a country, but a universe, not unlike those ‘universes’ created by other great countries, like‘universe China’, ‘universe India’ or ‘universe Russia’. Mexico is ancient and deep, and as mentioned above, it gave birth to some enormous civilizations, which were self-sufficient and much more advanced than the cultures of those who came to attack it, to plunder and enslave it. These civilizations, however, were robbed of their identity by the invaders, forcefully Christianized, then reduced to the level of ‘minorities’ in their own land. Natives were forced into slave labor, and used to mine their own silver and other raw materials, which were quickly shipped far away, enriching first Europe and later North America. Originally, all this was done by the colonists from abroad, and later, by the local elites on behalf of the West. The same story could be traced to all corners of Latin America; and a similar story to so many parts of the world. All this was done straight-faced. The West is never famous for soul-searching or spasms of guilt. No justification was provided. After all, there has been a Cross above the country named Mexico, and an imaginary ‘banner of civilization’ (Western one, naturally). I call all of it a ‘magic imperialism’, because the whole destruction of this ancient and beautiful world was done in an almost ‘poetic’ way: built on faith-based dogmas, as well as on military and expansionist theories, and the myths of racial, cultural and religious supremacy. All this took place during the colonial period, and it is taking place now, in the days of ‘free market fundamentalism’. “Is all this good or bad for the Mexican people?” Who cares! Such questions are not allowed. Mexican people are supposed to listen, accept, and obey the West, simply because the West is the most enlightened part of the world, because ‘it knows better’. The word ‘superior’ is hardly used (as it is ‘politically incorrect’), but it is presumed. Now Mexico is boiling. It has had enough of being treated like a child, like a slave, like an inferior part of the world. This time I travelled for three weeks all over the country, revisiting my ‘old places’. I wanted to hear what people think and say. I used to live in this country, for an entire year, some 20 years ago. Deep in my heart, I never really left. Now, everything looked both familiar, and at the same time, foreign. I spoke to people in Mexico City and Puebla, in Guadalajara, Tequila, Tlaxcala, Tijuana, Merida, Oaxaca, and I went deep into the countryside. Wherever I was, I felt fear. I detected anxiety, terrible anxiety. Yes, there was fear, but also determination to change everything, and to start from scratch. I was filming, a documentary here, with the working title: “Mexico–Year Zero”. It was not a binding title, but I was getting used to it, it was somehow fitting. Left-wing politician Andres Manuel Lopez Obrador (known as AMLO) won the Presidential Elections, securing great support in all but two states of the country. This can mean total overhaul, true change, a new beginning, if Obrador fights, if he is determined, if he serves the interests of his people. Or it may mean nothing, almost zero, if he hesitates, loses guts and surrenders to inertia. I spoke to at least a hundred people, in many parts of the country, perhaps many more. Not one, not a single one said, that his or her country is doing well! This, despite all sorts of positive economic indicators, despite a good position on the Human Development Index (HDI), and the fact that Mexico is, after all, an OECD country and the 15th largest economy in the world. ‘Magical imperialism’ brought this great nation to its knees. Everything here is full of contradictions. Mexico has much greater culture and lifestyle than the United States, but it is subservient to the North. 90% of its exports go straight to North America (U.S. and Canada). The Mexican view of the world is fully shaped by the brainwashing right-wing propaganda, literally flooding the country through such outlets like CNN en Español and FOX. Outraged by North American behavior, Mexico is nevertheless forced to see the world through the eyes of its great tormentor. RT, CGTN, PressTV, or even Telesur, are only available through the internet. This has to change. Everybody knows it has to, somehow. But how? So far, there is no plan. Is the President-elect going to come up with the one? And if he does, can he survive, or will he be harassed or even kicked out from his post or killed, as has happened to so many others, including Chavez and Dilma? Can any Latin American country gain its true independence from the global dictatorship of the West? Cuba did! Or should I write: so far, only Cuba has. And Venezuela, to a great extent, but both are paying a horrendous price. All over Mexico, there are reminiscences of the Western ‘involvement’, or should I say‘monuments of barbarity’. Often, one has to search for them, or even read between the lines, in order to identify them. The Supreme Indigenous Council of Michoacan, Mexico, accused the Catholic Church of being complicit in the killing of over 24 million Indigenous people. Some 30 Indigenous communities of Michoacan, Mexico, have released a statement demanding Pope Francis apologize for the genocide committed with the complicity of the Catholic Church against their people during the Spanish invasion of the Americas in the 16th century. For over 500 years, the original people of the Americas have been ransacked, robbed, murdered, exploited, discriminated and persecuted,” the Supreme Indigenous Council of Michoacan said in a statement. Well, Pope Francis, any comments; at least some desire to speak about justice? The self-congratulatory, almost poetic language of both the brochure and the introduction to it sounds truly, as if it is trying to fit into a magic imperialist realism. But it is not: it is just how history is taught in the United States, in Europe, and unfortunately, in many schools in the formerly and presently colonized countries. Then the French massacred people in Mexico City, as well as all over the territory that was left to the Mexicans after the 1846-1848 U.S. invasion. The French ‘intervened’ in Mexico on two occasions: from 1838 to 1839, and from 1862 to 1867, in which conflict, at least 12,000 Mexican people were killed. The French were killing, plundering and imposing their dictate, shamelessly and mercilessly, but that was not really ‘something exceptional’, as they were doing precisely the same, or worse,all over Africa, Asia, the Middle East, Caribbean and Oceania. 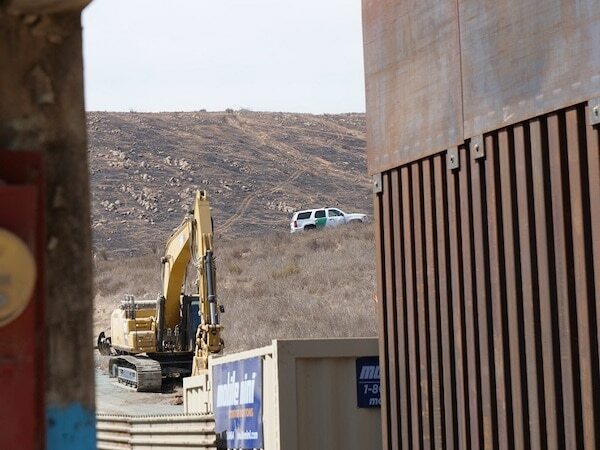 Now, right at the northern part of the enormous city of Tijuana, the U.S. authorities and their contractors, are building an enormous wall. It does somehow not look unlike the ‘perimeter’ built by Israel, between the occupied Golan Heights and the Syria proper. But then, many things look suspiciously similar, these days. This wall is a clear expression of a thorough imperialist madness. This entire land used to belong to Mexico, before the 1846 invasion, or call it ‘officially’ Mexican-American War. Both countries are part of one continent. Both sides of the border are inhabited by essentially the same people. There are millions of Mexicans living in California, and there are millions of North Americans who are seeking better life south of the border–in Mexico–either in the retirement colonies, or, for instance, as students at much cheaper and good Mexican universities, or as artists. North Americans travel to Mexico to get their teeth fixed, Mexicans go north to get better paid jobs; the border area is basically an integrated zone, with its own music, traditions, history and folklore. I know it well, and I know that it used to have its own magic and yes, its realism too. Now it is gone, thoroughly ruined. But as if in a novel by Gabriel Garcia Marquez, even through all that dust and insanity, one can still feel the magic. Here, I am still in Latin America, at its edge, at the last inch. And, screw the wall! 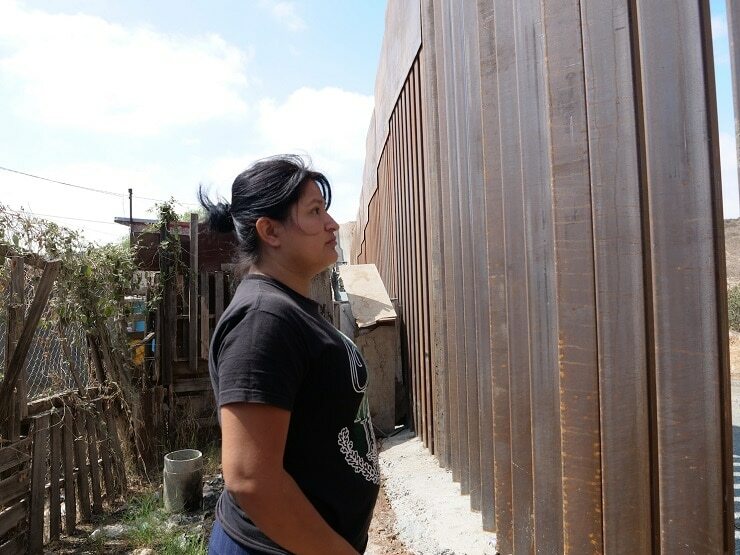 I face a Mexican woman; whose back is against the U.S. constructed wall. Her house is just one meter from the perimeter. If she sticks her finger through the bars, she is technically in the United States. Her name is Leticia. She almost brings tears to my eyes. A narco, a ‘small fish narco’ who is accompanying me to the wall, explaining ‘the reality of the border’ and how the drug cartels here work, suddenly produced one short and loud sob. He is a Latino, after all. He may be a gangster, but he has a heart. I know,mostly it is not Mexicans who are trying to jump the fence. The majority of Mexicans are middle class, and the middle class lives a better life here than in the constantly stressed and overworked U.S. It is those desperate people from Central America who are risking their lives, crossing–from Guatemala, Honduras–people whose governments were overthrown by Washington, people whose countries were destroyed. People who are suffering from gangs and narco-mafias–direct consequences of the civil wars triggered by the West. These people are traveling on the monstrous Mexican cargo trains called “La Bestia”, “the beast”; they are having their limbs cut off when they fall from the roofs down onto the tracks. I follow them, I film them, I talk to them. They are on the move, from the southern Mexican border towns all the way to the north; to the U.S. border. They have no choice. And Washington knows it. It took socialism away from them–in Honduras and Guatemala it did. Then it rewarded them with this damn wall. Central America is in ruins. Mexico, potentially one of the greatest nations on Earth, is stagnating, living in fear, suffering from corruption and crime, from servile and obedient (towards the West) elites. This entire mess has been triggered by neo-liberalism, as well as the selfish over-indulgence in the North. Comes Andres Manuel Lopez Obrador. Mexico is tired. It does not believe in itself, anymore, but it voted, clearly and proudly. It wants to hope. It wants to believe. It wants to live. It tries. They have no clue what will come next. Is the man they voted for really with them? Radical intellectuals at UNAM do not think so, they told me. But the poor Mayan and Azteca villages, the core of this country, are with him. They trust him. They hope. He has no right to fail them. “If he fails the poor, there will be a civil war. He is our last hope,” I was told in Tijuana. Hope is all that poor people have. That is why, comrades, do never play with hope! If Obrador succeeds, if he delivers even half of what he promised, Mexico will dramatically change. The entire Central America will change, perhaps the entire Latin America will. This is the most populous Spanish speaking country, a cultural and intellectual powerhouse that has been asleep for many long and painful decades. This is where magic realism rubs shoulders with that magic imperialism imported and implemented by the West. I landed here, symbolically on September 14, the night when Mexican Independence Day is, historically, celebrated. I did not sleep. I went to Zocalo, to see the people. Enormous fireworks illuminated the sky of the city where the Spanish cathedrals are built on top of the ruins of the great native civilizations. Poor and rich were standing, watching the colorful show, looking at an enormous flag. The day after, I was filming at the splendid Bellas Artes, one of the most beautiful theatres on Earth. There, a Soviet-trained conductor was facing a brilliant ‘youth orchestra’, which consisted of once poor boys and girls from deprived communities. On the stage, the legendary Folkloric Ballet of Mexico was performing; with proud native themes, and with young women holding rifles, marching towards the redness of the revolution. The audience roared. People, strangers, were embracing, shaking hands. There were tears; tears of joy. Oh Mexico! 2018. Year Zero, I call it. Yes, this is how I will name my film. Year Zero. The revolution, hopefully. The new beginning. The independence. Hopefully. I did not vote for Obrador, because I do not believe that what he was promising during his campaign, could be achieved. But I hope that he is real. If I see that he is real, I will drop everything and dedicate my life to supporting him. To save Mexico is to stop neo-liberalism, dependency on the West, and to join countries that are fighting against the global dictatorship. Can it be done? Will it be done? In a few short months, the fate of those humble villages of Yucatan and Chiapas will be decided. The entire Latin America is watching. To change Mexico looks like an impossible task. But it has to be performed. True revolution should put the Mexican people first, and put the final end to those terrible centuries of plunder, humiliation and terror. To hell with magic imperialism. To hell with any imperialism! Andre Vltchek is a philosopher, novelist, filmmaker and investigative journalist. He has covered wars and conflicts in dozens of countries. Three of his latest books are his tribute to The Great October Socialist Revolution a revolutionary novel Aurora and a bestselling work of political non-fiction, Exposing Lies Of The Empire. View his other books here. Watch "Rwanda Gambit," his groundbreaking documentary about Rwanda and DRCongo and his film/dialogue with Noam Chomsky “On Western Terrorism”. Vltchek presently resides in East Asia and the Middle East, and continues to work around the world. He can be reached via his website or twitter.